NEW WEST NEWS – Krista Woodward’s throw of 52.82 metres earned her the gold medal in women’s javelin at the 2013 Jeux de la Francophonie in Nice, France. Canadian athletes won 22 medals, including six gold, eight silver and eight bronze, at the games which involves competing from more than 60 French speaking countries in eight disciplines. Burnaby’s Curtis Moss also won a silver in the men’s javelin with a throw of 76.04 metres. VICTORIA NEWS – Although they are separated by 60 years in age, young Ben Sammons and Masters competitor Les East have one thing in common — exceptional performances in the sport of track and field. At the season-ending barbecue and picnic for the Peninsula Track and Field Club, Sammons, 13, and East, 74, were named as joint winners of the Inspirational Athlete Trophy for 2013. Their names will go on the trophy to join with those from previous years, including Olympic bronze medalist Angela Chalmers, sprint champion Tom Michell and decathlete Greg Dingle. Sammons set a career high of 38 personal best performances in both hurdles and flat races on the track, as well as in many jumping and throwing events. 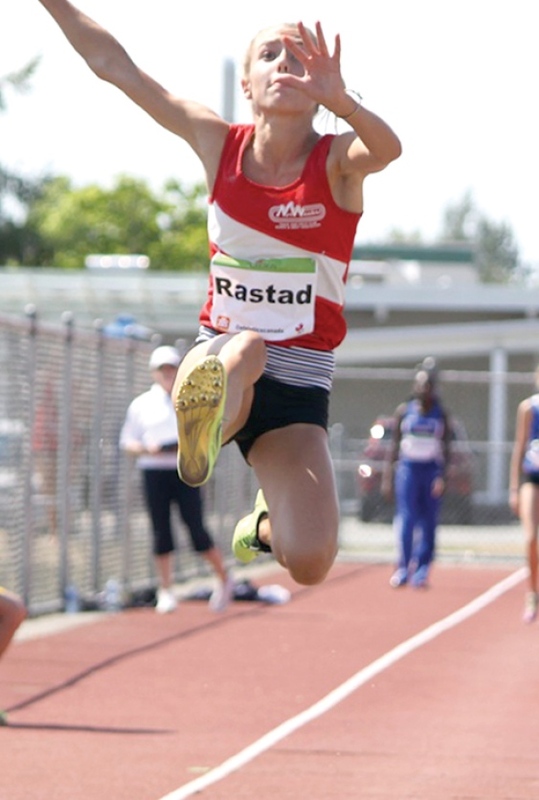 East was a gold medalist in both throwing and jumping events at the BC and Canadian Masters Championships and at the B.C. Seniors Games. Sarah Gibson, Julia Irwin and Meagan Peterson shared the Fiona Clarke (girls) award, given for performance excellence and sportsmanship, while the boys award went to Finn Battersby. Oliver Adam, Matteo Hilton and David Johnson will have their names engraved on the Eleanor Richardson Memorial Trophy for participation, cooperation and dedication. In the specific event categories, Conor Loughnane and Connor McCoullogh received the Runner of the Year trophies, and Julia Peterson was named Jumper of the Year. Another Masters athlete, Carl Jensen, was given the Thrower of the Year trophy for his prowess in the Island series meets and at the Victoria Highland Games. At opposite ends of the sport, first-timers Blake Furtado, Alyssa Jensen and Olivia Lucas were acknowledged at Outstanding Novice Athletes, while the Outstanding Masters Athlete trophy went to Anne Murfitt in recognition of her six gold medals from the Canadian Masters Championships. KAMLOOPS THIS WEEK – Dylan Armstrong finished tied for third in the overall 2013 Diamond League shot-put standings after the last event on the circuit was held in Brussels, Belgium, on Friday, Sept. 6. He placed fourth on Friday with a toss of 20.76 metres. Ryan Whiting of the U.S. threw 21.45 metres to win gold and lock up first place in the overall standings. COWICHAN NEWS LEADER PICTORIAL – Liam Lindsay jumped into the track and field circuit in a big way in 2013. Lindsay, 17, a Grade 12 Cowichan Secondary School student, just missed a medal in fourth place for the triple jump at the Legion national youth meet and finished 10th in the long jump. Nursing a leg injury along the way created an extra challenge. Lindsay’s personal best in the triple jump is 13.28 metres from the Team B.C. qualifying meet in Kamloops this year. His 6.25 metre personal best in the long jump came during the provincial high school meet in Langley. “I’m looking to start training full seasons starting in September and do some ground work and strength training before we move on to technique later in the season,’’ Lindsay said. LANGLEY, British Columbia – The Trinity Western track and field team added a massive piece to their puzzle as Spartans coach Laurier Primeau announced the signing of sprinter and long-jumper Sabrina Nettey (Surrey, B.C. ), who was the 2007 BC Sports Female High School Athlete of the Year, Tuesday. The 5-foot-6 Nettey, who graduated from Johnston Heights Secondary in 2007, arrives at TWU with personal best times of 11.75 in the 100m, 23.99 in the 200m and 6.26m in the long jump. By comparison, at the 2013 CIS championships, Calgary’s Rachel Machin won long jump gold with a jump of 6.01m, while the Canada West long jump record is 6.10m, which was set by Saskatchewan’s Vanessa Monar in 1993. Nettey, who was also the 2007 BC High School Track and Field Most Outstanding Female Performer, most recently competed at the 2013 Summer Universiade in Kazan, Russia, where she finished eighth in her qualification group after jumping 6.22m. She will enter her second year of CIS eligibility this fall. “I’m excited to complete my degree at such a close knit campus where I will get the opportunity to interact with other believers both in the classroom and on the field,” said Nettey, who plans to study psychology at TWU. The Spartans first track and field meet of the 2014 season is January 12 in Seattle, Wash. at the University of Washington Preview. PARKSVILLE QUALICUM BEACH NEWS – Further to our story last week on Qualicum Beach standout Thomas Riva, who made history in these parts recently when he garnered gold and silver medals at the Canada Summer Games, The NEWS caught up with the dedicated athlete to get his take on raising the bar. Played Aug. 2-17 in Sherbrooke, Quebec, the national showcase, held every four years, featured over 1,200 athletes competing in 17 sports. “It was great — the city of Sherbrooke did a fantastic job hosting it, and it was kinda cool to be around so many different types of athletes,” Riva, 21, recounted from Victoria when we finally caught up with him. As it turned out it was the 1,500m event in which he won gold (with a personal best time of 3.45:87), and his silver came in the 800m (1:48.91), an event in which he is currently ranked fourth in Canada. The 1,500m race was decided on the home stretch when he pulled away in the last 100 meters, knocking a full four seconds off his previous best time. “It was close but I just kicked it into high gear. It was pretty sweet,” he chuckled. Riva, a Kwalikum Secondary grad and the younger of two siblings, honed his skills with Oceanside Track & Field for about eight years. “I pretty much grew up with the sport,” he said. The Canada Summer Games capped off a season — his third with UVic — that started indoors back in January. Riva is part of a UVic Thunderbirds track and field team of around 18 young men and women. “It was a really good stepping stone for competing in multi-sport games and for representing Canada,” he said. Riva, an engineering major, will now get a few weeks off to recharge the batteries before starting cross country in September. Contacted via email (from Europe), UVic cross country/track head coach Brent Fougner had great things to say about his Oceanside standout. “Thomas has a great work ethic and his determination to excel combined with natural talents make him a pleasure to coach,” said Fougner, who was a track coach for Team Canada at the 2008 Beijing Summer Olympics, and is an eight-time CIS Coach of the Year heading into his 25th season leading UVic’s middle distance program. He added, “Thomas came to UVic from a very successful youth program in the Parksville Qualicum area where knowledgable coaches guided him, developing his speed and running technique. Thomas’s unassuming and humbling nature is necessary in a successful runner where hours of running each week, most of the time alone, is not a sport for the prima donnas. Olympic high jumper Mike Mason from Nanoose Bay is the only other OTFCer to medal — gold in 2005 in Regina. 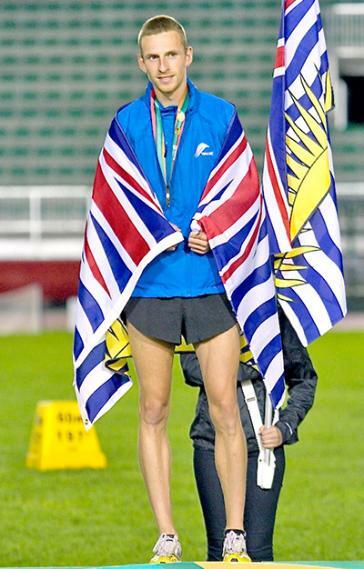 Parksville’s Alycia Butterworth, currently attending the University of Idaho on a track and cross country scholarship, competed in the 2009 games in Charlottetown, placing fifth in steeplechase.